See our featured segments from Paula Sands Live on KWQC TV6. Questions are an excellent way to learn. If you don't ask you will never know! Some terms that you may need to know when looking at a replacement window! 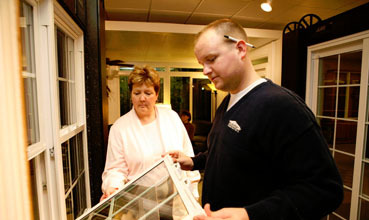 Having trouble, or want to know more about your new window? Here are some easy steps for caring for you new windows! Go deeper and see what you can do to save money by Going Green in your home, and save the environment at the same time! Educate yourself to better understand what your needs are. Technology is always changing and windows are no different! Some resources, for you as a consumer, to help make your decision on products much easier! The Better Business Bureau is a great place to check out companies in your area! Take a look and see what your friends or neighbors are saying about Suburban Construction! Please enter the number 18635 in the box provided below.